Exchequer ecommerce integration for Clayman Supplies - Ocean Ecommerce. "The level of automation and speed of synchronisation is a wonder to behold. I wish we had Ex-Commerce years ago!" 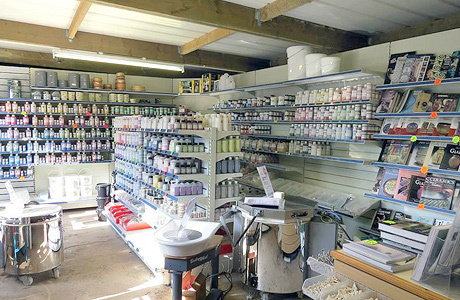 Clayman Supplies Limited was formed at the end of 1978 as Nyetimber Pottery Supplies, initially supplying craft pottery and materials before subsequently extending their business to providing pottery equipment. They have built a reputation of competitively priced quality products for the hobby, craft and semi-industrial potter for over 25 years, and are currently one of the leading suppliers to the education, craft and hobby market. They import from China, Taiwan, Australia, America and a number of EU countries. Clayman is official distributors for Chrysanthos Colours and Glazes, Paintec Spray Guns, in addition they are a merchant for St Gobain (British Gypsum) Plasters. After dealing with the frustrations of using another solution, they brought in the Ex-Commerce team to replace their current system which fell short of the customers requirements. Despite the solution being partly integrated, the system required too much manual input with orders coming through in batches despite promises of real-time transfers. The integration was such that it was apparent it had been designed with other systems in mind with some features not being accessible from an Exchequer specific standing point. After battling with the 'partially integrated' system for years Clayman finally decided that it was time to move on to a better fully integrated system. The first step in the move was to use the specialist Ex-Commerce migration tool to move all stock, images, customers and orders from the current integration into the new system. Upon doing this the system was live within days and allows the automation and speed required for a retail store. Now that their new Ex-Commerce solution is live Clayman can take advantage of the huge list of features provided by the CMS and look forwards with potential future options such as multi-currency and rapid development of custom modules to run alongside the core system.